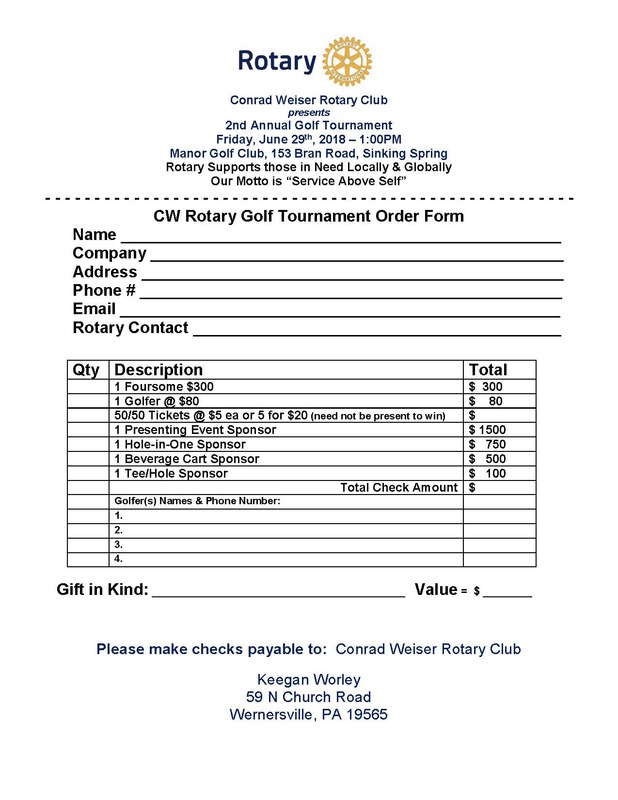 Welcome to the Conrad Weiser Rotary Club! The main prize hole-in-one will feature a free $5000 vacation of choice, and all par-3 holes will have prizes ranging from golf equipment to free air tickets. A light lunch and a full dinner are included in the $80/single golfer; $300/foursome registration fee. Penn Werner Caterers will have a "Pit Master Smoker Menu" that will offer "Low 'n Slow" smoked pull pork BBQ, tender smoked chicken w/ sauces and carved smoked beef brisket, with all the fixins. Please provide registration information for foursomes (or singles) to Keegan Worley. He can be reached at keeganworley@gmail.com or 610-413-1188 with any questions. There are also sponsorship opportunities for the event: Presenting Event, Hole-in-One, Beverage Cart and Tee/Hole Sponsors. Consider joining us for a fun-filled event! We honored our May Conrad Weiser High School students of the month, Crystal Kaczmarczyk and Mason Wolfskil, at our lunch meeting yesterdayl. Crystal and Mason are an integral part of Conrad Weiser, involved in many extra-curricular activities; they demonstrate what we love to see in students: hard work and determination! Congratulations, Crystal and Mason. coordinating surgical missions in developing countries; training and mentoring local physicians; launching public education projects; and advancing research. worldwide by the year 2025. The Four Way Test Speech Contest is a competition for 9-12 graders that requires each participating student to create and present a 5-7 minute speech on a subject of their choice, applying the Rotary Four Way Test to guide their thinking and their actions. The contest is a three-level contest, with Club Contest First Place finishers advancing to one of four Regional Contests and those four First Place finishers advancing to the finals at the District 7430 Conference. Rachel Maurer, Leaugeay Genduso, Olivia Scholl and Kwis Montinard presented at the CW Rotary Club Contest last month. They were all wonderful speeches, covering a wide range of topics, that "wowed" our members! They all took home a cash prize and certificates, but Rachel was able to move on to this past weekend's Regional Contest, in which she placed 2nd and took home more $! A special thank you to Kathy Mohn at Conrad Weiser High School for coordinating this! Congratulations to our Club Contest participants, and to Rachel for placing 2nd in the Regional Contest! We celebrated the conclusion of our Rotary District's two-year "Million Dollar Journey" that raised $2.5+ million in donations to the Rotary Foundation. 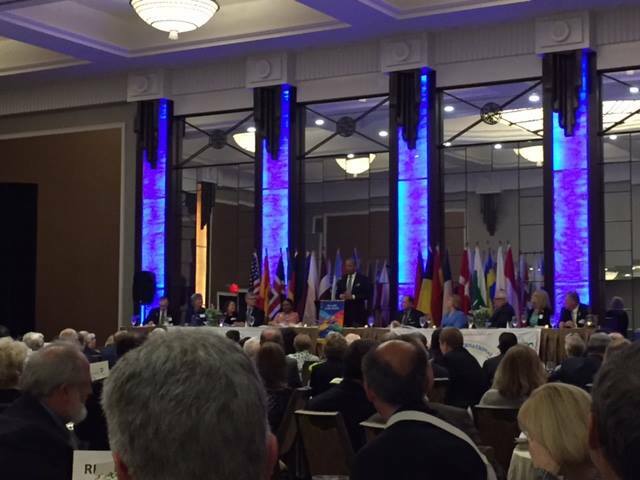 Rotary International President Ravi Ravindran from Sri Lanka, as well as RI Directors Julia and Mike were present. 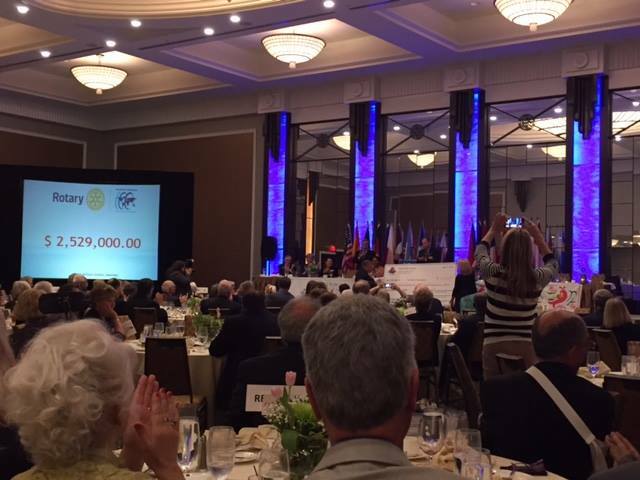 Congratulations to District Governor Doug and his Committee for a successful event! 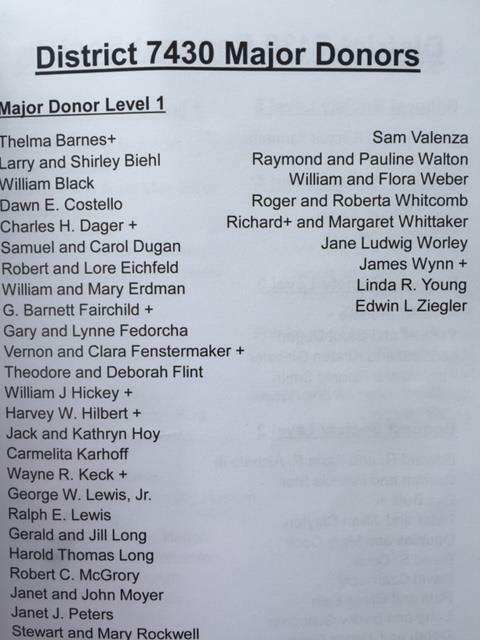 One of our former members, Jane Ludwig Worley, was recognized in the program as having been a Major Donor during her lifetime. 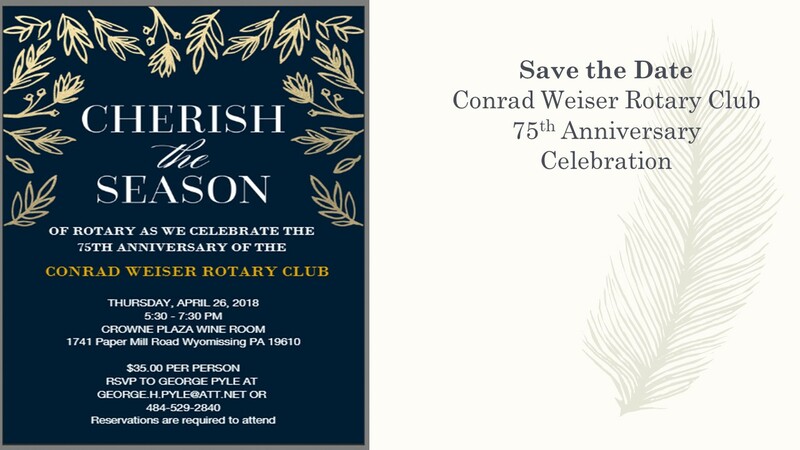 Jane died in 2008, but her name and legacy are carried through the CW High School Scholarship we present each year, the "Jane L. Worley Conrad Weiser Rotary Club Scholarship." Every year, our club awards the Jane Worley Memorial Conrad Weiser Rotary Club Scholarship at the CWHS Senior Awards to a extraordinary student who has devoted much of his or her life to community service through extra-curricular organizations in high school, as well as within the Conrad Weiser community. Jane Ludwig Worley was a longtime member of the club who was an ardent supporter of all things Rotary. An avid world traveler, Jane visited the local Rotary clubs wherever she would be visiting, then would share stories when she returned home. Pictured is President-Elect Keegan, Jane's grandson, who presented to to this year's recipient, Rachel Rathman. 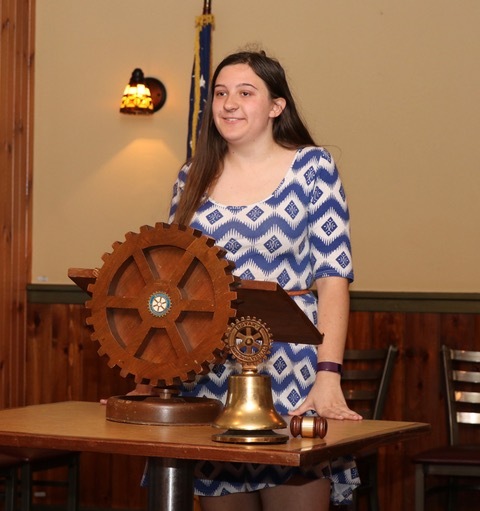 Rachel, a Rotary Student of the Month, logged over 280 hours of community service over the course of her high school career by volunteering at Hain’s Church, Little Scouts Field Hockey, Womelsdorf Swim Team and Mini-THON. She was accepted to the Congress-Bundestag Youth Exchange and will be spending the next year in Germany attending a Language Training School, High School and working at an internship. Subsequently, she will begin her collegiate career at Albright College. Congratulations, Rachel! 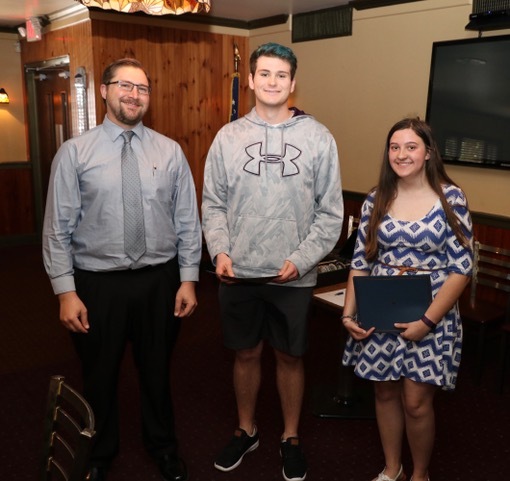 At our lunch meeting last week, we featured our final two Conrad Weiser High School Students of the Month for this school year, Katelyn Williams and Kody Bosch. Katelyn and Kody talked to us about their high school experience and involvement in clubs, volunteer work, etc., as well as their future plans after graduation. Our program speaker for the meeting was Stratton Yatron, who is one of the founders of Adelphi Kitchens and also a longtime member of our club! Strat told the very interesting story of how he and his brothers started their business without any monoday! Today at our lunch meeting. we recognized our April Conrad Weiser High School Students of the Month: Kallie Lutz and Dylan Schoemaker. Both seniors going off to college, Kallie and Dylan are heavily involved in their studies, extra curricular organizations and sports. They were accompanied by their families and were presented with a certificate and gift card. Congratulations! Member Carl Sabold brought Jackie Steed from the Council on Chemical Abuse as the program. Ms. Steed spoke about the many different types of additions, the prevention, intervention, treatment and recovery mechanisms COCA offers - check out the great things COCA does for Berks County at www.councilonchemicalabuse.org! Sharon & John Levan, Chris & Greg Werner and "5th Wheel" Keegan Worley having fun at Rotary District 7430 Conference in the Poconos this past weekend! Among live entertainment, there was a photo booth after the District Governor's Dinner - a Hawaiian-themed event. Thank you to all who made our Casino Night a HUGE SUCCESS! 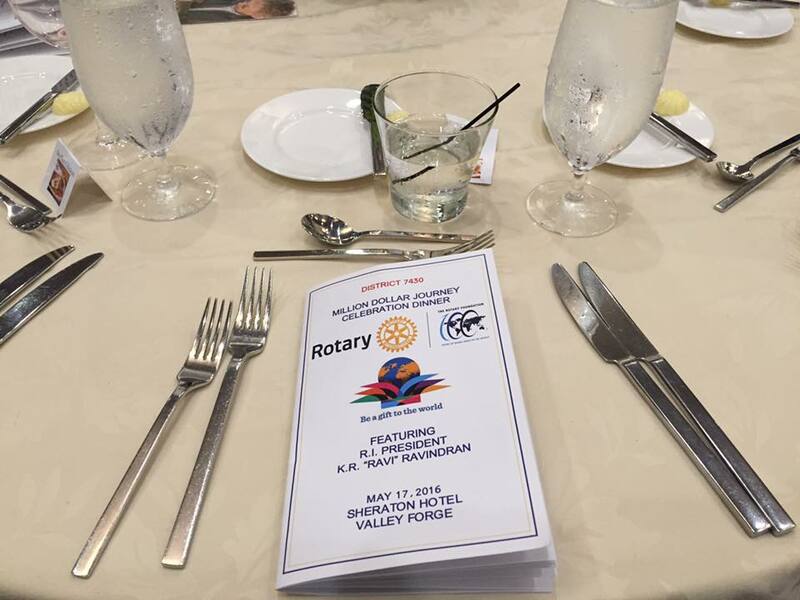 Our Club partnered with 3 other Berks County Rotary Clubs to put on this fundraiser that helps broaden our reach in the community and abroad; most especially to our fight to eradicate polio. This year we raised OVER $12,000 thanks to your help! From our Club to you: THANK YOU!! We would also like to welcome our newest member, Becci Shaak! Becci is the Vice President of Finance and Corporate Treasurer for Caron Treatment Centers. We are excited to work with her in our club's future endeavors! 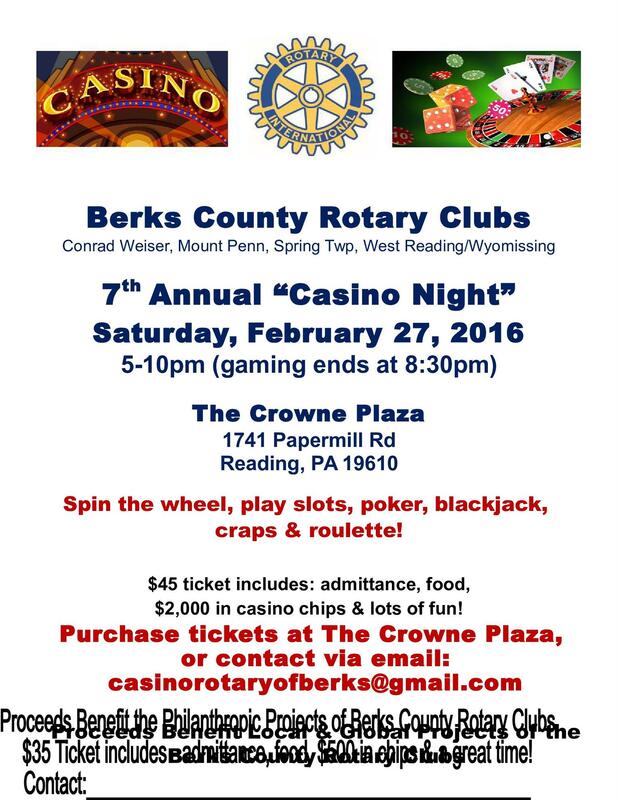 Four Rotary Clubs in Berks County—Conrad Weiser, Mount Penn, Spring Township, and West Reading/Wyomissing—will be sponsoring the 7th Annual Casino Night at the Crowne Plaza on February 27th from 6-10 pm. Local businesses will be sponsoring the gaming tables, along with donations of gift baskets, gift certificates and larger items for the silent auction. All of these help the fundraising efforts, which, in previous years, has yielded thousands of dollars toward the goal of ending polio. Polio is a cruel disease that was once prevalent throughout the world. The virus invades the nervous system and can cause total paralysis in a matter of hours. It can strike at any age but mainly affects children under five. Polio is incurable, but completely vaccine-preventable. With the help of over $1.5 billion contributed by Rotary and the countless volunteer hours to assist immunization efforts, fewer than 370 polio cases were reported in all of 2014. Compare that to the 1980’s, when 1000 cases per day were not uncommon, and it becomes evident that the efforts have been successful. Today, there are only two countries that have never stopped transmission of the wild poliovirus: Afghanistan and Pakistan. Yet, despite the undeniable success of the Rotary program, the goal remains to eradicate this paralyzing and potentially fatal disease. Toward that goal, the Global Polio Eradication Initiative was formed in 1988. It is a public-private partnership that includes Rotary, the World Health Organization, the U.S. Centers for Disease Control and Prevention, UNICEF, the Bill & Melinda Gates Foundation, and governments of the world. Every dollar Rotary commits to polio eradication will be matched two-to-one by the Bill & Melinda Gates Foundation up to $35 million a year through 2018. These funds help to provide much-needed operational support, medical personnel, laboratory equipment, and educational materials for health workers and parents. Until polio is eradicated, all countries remain at risk of outbreaks. So, the work continues to reach that goal through large foundations and many smaller, local events like Casino Night. This is the only opportunity to “gamble” where everybody wins…most importantly, all those children worldwide who will not suffer from polio. Contact Keegan Worley at 610-413-1188 for more information! We recently welcomed our Rotary District Governor, Doug Cook, who spoke to us on the initiatives he, with his District's help, has been tackling this year. His focus is "Fighting Hunger," so our club thought it best not only to present a check to the Conrad Weiser Food Pantry in Doug's name, but also to welcome him with more than a dozen bags of non-perishable food products to also be donated to the CW Food Pantry. Continuing Rotary's motto of "Service Above Self." Car Wash Tickets for Sale! Looking for the perfect stocking stuffer or just want to keep your car clean during the winter? Rotary Club members are selling car wash tickets for AutoSpa and Mister Hot Shine (formerly Cloister)! AutoSpa: Exterior Only- $9/each or a book of 5- $45. Please contact us if you are interested! Happy Holidays! 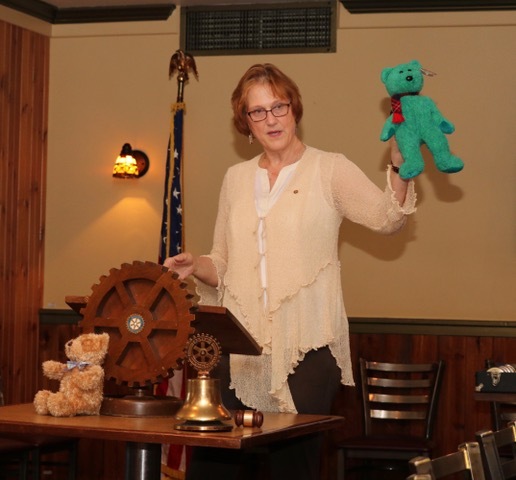 On June 30, 2015, an Installation dinner for the Conrad Weiser Rotary Club was held at the Stouch Tavern in Womelsdorf. New officers and board directors were welcomed to their positions. Elected as president to the Conrad Weiser Rotary Club, Greg Werner received the gavel from Past-President Keegan Worley.. Others installed include President -Elect Keegan Worley, Secretary Sandra Kuchar, Treasurer George Pyle, Board Directors Pam Colleti, Lynn Kreider and John Levan, Foundation Chair J. Robert Kehrli, and Membership Chair Sandra Kuchar. Other members in attendance were Miriam Smith, Sharon Levan, Stratton Yatron, Ken Buck, Carl Sabold. Tom Drexler, John Hampson, and Fred Krott. Awarded for their perfect attendance during the year were Keegan Worley, George Pyle, Greg Werner and Sharon Levan. Thank you to everyone who attended. We welcome the new officers and board members to the Conrad Weiser Rotary Club for the year effective July 1, 2015 through June 30, 2016. Congratulations to our April Conrad Weiser H.S. Students of the Month, Jessica Duncan and David Gerhart! Jessica and David were accompanied by their families at our latest meetings as they were each honored with a certificate and gift from the Rotary Club. Congratulations to Conrad Weiser High School seniors Mary Ocepek and David Nelson for being January's CW Rotary Students of the Month! Mary and David were accompanied by their families at our latest meeting as they were each honored with a certificate and gift from the Rotary Club. Congratulations! 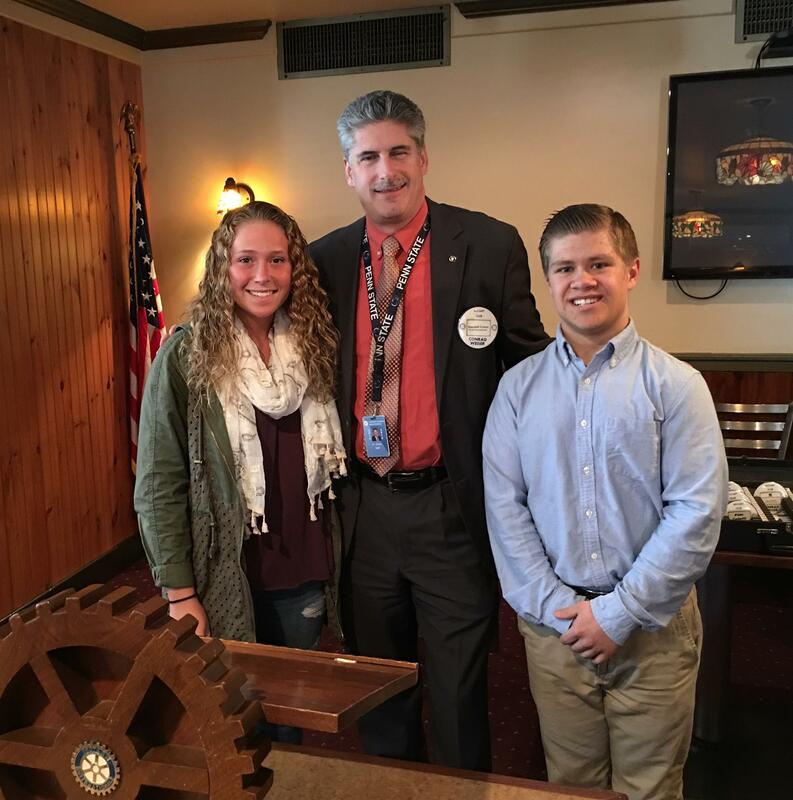 Congratulations to Conrad Weiser High School seniors Lindsay Palm and Aaron Sadowski for being selected as November's CW Rotary Students of the Month! Lindsay and Aaron were accompanied by their families at our latest meeting as they were each honored with a certificate and gift from the Rotary Club for their hard work in their academics and service to our community. 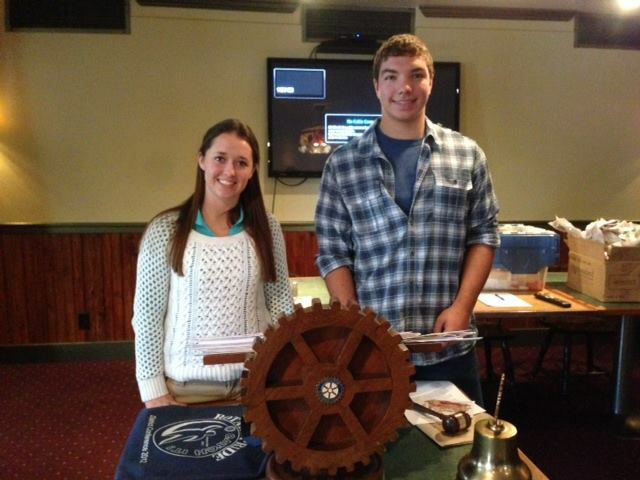 Congratulations to Conrad Weiser High School seniors Kirsten Lebo and Andrew Meglathery for being October's CW Rotary Students of the Month! Kirsten and Andrew were accompanied by their families at our latest meeting as they were each honored with a certificate and gift from the Rotary Club. We would also like to welcome our newest member, Pam Coletti! Pam is the Branch Manager at Fulton Bank in Womelsdorf and we are excited to work with her in our club's future endeavors. We would like to introduce a new member, Lynn Kreider! Lynn is the Owner/Instructor of LJ's Fitness in Womelsdorf and, since joining us in July, has brought many great ideas and even a new member! This year's annual fundraiser for the Wernersville Library, the Robesonia Community Library, and the Womelsdorf Library (in conjunction with Conrad Weiser Rotary Club) will be held on Sunday, September 29, 2013 at Johnny and Hons Smokehouse on Route 422 in Robesonia from 4pm until 7pm. It will feature pulled pork, hot pasta, and chicken as the main course and lots of Silent Auction items. Tickets are $25.00 with all profits benefiting the libraries and the Rotary Club. Please contact us if you are interested in attending! Congratulations to the newly elected officers of the Conrad Weiser Rotary club! Elected for 2013-2014 were President, Sharon Levan, President-Elect Keegan Worley, Treasurer, George Pyle, and Secretary, Sandra Kuchar. The Board Members who will be serving are J.Robert Kehrli, John Hampson, Greg Werner, and Past-President, Mary Bossard. t's National Library Week. In an increasingly complex world, poor reading comprehension condemns adults to the lowest rungs of society. Worldwide, Rotarians take part in literacy projects in their community and globally. Take advantage of the great libraries we have in our communities! On behalf of the Conrad Weiser Rotary Club, we would like to congratulate Megan Campbell and Connor Tom for being selected Students of the Month for April! 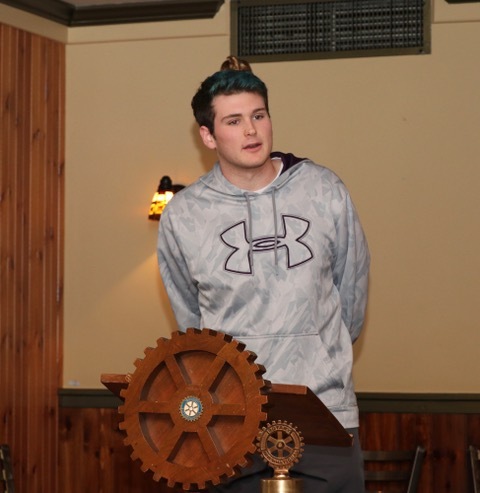 Two Conrad Weiser High School seniors are selected each month to be honored as the Rotary Club of Conrad Weiser's Students of the Month. Selections are determined by school merit, as well as extracurricular and community involvement.